I’m so proud of you guys. I don’t even know the joy. I have on this bright orange-red to show you guys like this is my fire. I’m representing that I’m fired up just over each and every one of you have done, what you’ve done with your business. Yes, I should’ve worn my purple. I should’ve worn my shirt, but I wanted to be formal with my, and showing off my little curves and stuff with you guys. On a serious tip, everything that I do at Academy is love. I charge because when you give things away for free people don’t value it. If I even thought for a moment that each and every one of you would value this training and not pay I probably would’ve given it away for free. I answer every phone call that I possibly can when people call my office. I do have a team even though people think I don’t. I literally race to that phone because I want to hear who’s on that other end, who wants to join my academy and why. Most of you I have spoken with prior to you joining. Some of you have been here a year. Some of you have been here for two years. Some of you have been here for three years. You guys are watching this Academy transform and I literally just want to say I really, really, really appreciate each and every one of you for investing in yourself and for creating a legacy for you and your family. Three kids too, so so many things happen in life and people try to define you. This world does everything that it freaking can to scare you, everything. It’s almost like the moment you’re born this fear factor comes in. Many of us have lived, we have literally walked in fear all of our lives. I’m afraid to walk outside. I’m afraid to eat new foods. I’m afraid to start a business. I’m afraid to grow a business. I’m afraid to pick up the phone. I’m afraid to not pick up the phone. I’m afraid for people … These are not mine, but these are just fears that we walk around with, whether we talk about them openly or whether we don’t, we walk around with these fears. When you really step outside of your comfort zone and you say, “You know what? Middle finger to my fear, I don’t really care that I’m afraid anymore,” the worst thing that can happen is that I’ll still be afraid when this is over so I’m going to step up there and I’m going to do something and I’m going to impact my life. I’m going to invest in myself. I’m going to invest in my family. That’s when you will find a level of freedom in your life that you can’t even imagine. Each and every one of you that has taken the time to invest here at Staffingpreneurs Academy, whether you’re walking in fear or not, you’ve taken that first step. I am so humbled to be in this little, tiny community with each and every one of you. 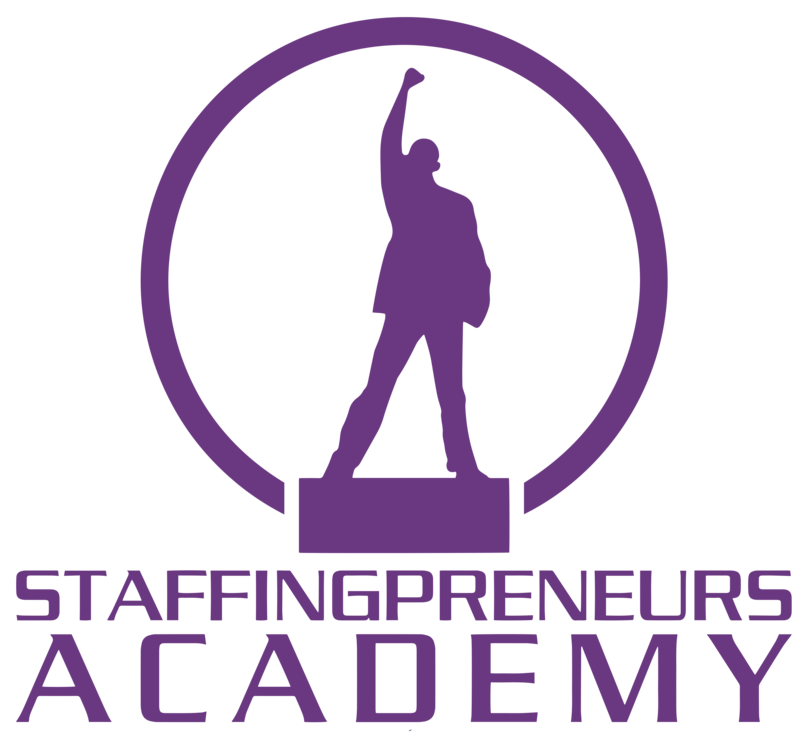 I dream about Staffingpreneurs Academy. This is my favorite business. Literally, I get dressed tonight to hang out with you guys. You all don’t understand on days like today I’m so full because I keep telling you all, the day that I found out I was going to die in 2013, they told me to write my will. They called my mother. They told my mom to come down, try to make arrangements for my passing, and I’m sitting in my bedroom on bed rest mind you, and I said, “Let me build Staffingpreneurs Academy.” How can you be on your death bed and all you’re thinking about is building some crazy little community? I did that and piece by piece and I promise you guys when I first launched the Academy half the training you all saw in there wasn’t in there. I let everybody in for free. I didn’t even really know what I was 100% doing. I just had this vision from being on my deathbed that there were people out there who needed me, and I was going to do it. I was going to figure it out whether I died or not. How fast can I get this thing built so if I do die it’ll still live? Listen, I am so humbled to be in this space with you guys. I’m trying to hold my tears. It’s not 100% working, but I just need you guys to know, honestly, I’m so thankful for each and every one of you. I’m so thankful that you guys are here. I’m so thankful I get to hang out with you. I’m friends with a lot of you actually. I talk to you guys. I have to stop talking to many of you because I get so many calls a day, but I love talking to you. I remember your family’s names, your children’s names, your husband’s, your wife’s name. This is what I do. This is what I love, so I just want to say thank you so much for investing in yourselves. Thank you so much for believing in me. Thank you so much for sharing Staffingpreneurs Academy with other people. Over the next couple of months, you guys are going to see me really out there doing a number of things. I’ve got two books launching this year. I’m opening up a couple of my other academies to the public that are closed, that are entrepreneurial-focused. If you guys want to join those two let me know. I’ll give you some discounts so that you guys can just be a part and meet other people because I meet amazing people who are just like you. I’m not going to get mushy anymore. I just wanted to say thank you so much. 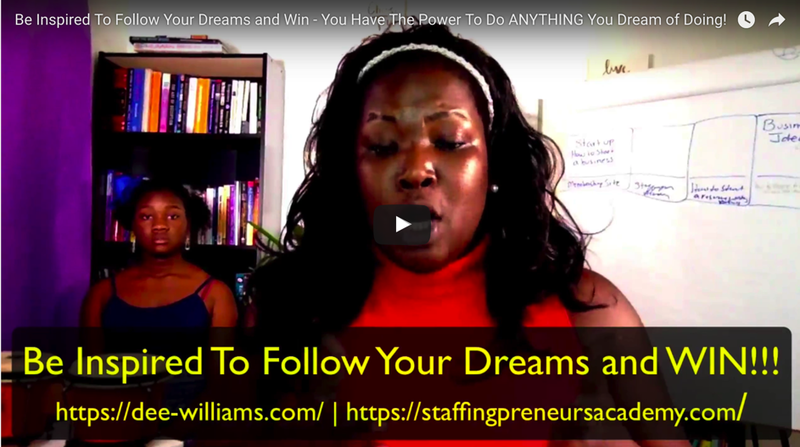 0 Comments on "Be Inspired To Follow Your Dreams and Win – You Have The Power To Do ANYTHING You Dream of Doing!"